The 10-year Treasury rate fell almost 10 bps to close at 2.52 percent, just 4 bps off its August 24 recent low. A close below 2.50 percent will clear the way for a move to challenge the December ’08 low of 2.03 percent. Surprisingly, the S&P 500 is almost 100 points above its August 24 close. The bond, equities, and commodities have been moving together in a powerful rally since early September. If sustained, it would be an early sign loose monetary conditions are beginning to bite. We wrote in August that the 1o-year Treasury bond was fundamentally overvalued at 2.5 percent yet could rally to 2.0 percent with a new round of European sovereign debt worries or the announcement of QE2. We expected a back up and thought 2.80 percent would provide a good entry for traders. The closing high during the correction was 2.795 percent. We recognize the bond, given its small size relative to other asset classes and pools of liquidity, lives, simultaneously, in two realities. The fundamental reality, based on economic, credit, monetary and foreign exchange risks, is that the bond is overvalued at 2.50 percent, in our opinion. 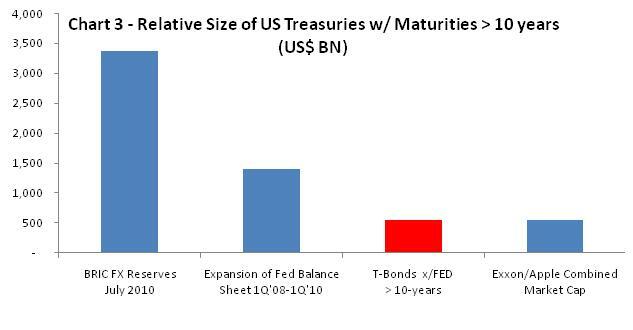 The technical reality is different story, however, where the Fed could theoretically could buy up the entire curve from 10-30 years with just half what it spent in QE1 (see chart). We have learned not to fight the Fed. So there you have it. Two realities, two cats. One cat named Dave, who says the bond is fundamentally cheap based on the economic outlook and move to 2 percent is a done deal. The other cat named Doug, who says the bond is the “short of the decade,” but getting the timing right is difficult. We side with Doug and will look for strong technical confirmation before entry or a reversal in the fundamental reality, such as change in monetary policy and/or economic conditions. Stay tuned! 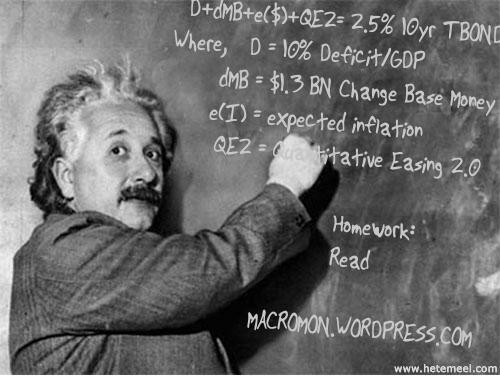 This entry was posted in Bonds, Monetary Policy, Sovereign Risk. Bookmark the permalink. Agree with your thesis. The US should probably bring back the Long Bond as a way of mitigating this problem. Not to mention that it would be a great yield curve play for the US. one main type of Honey Bee, with two subspecies that may be affecting the United Kingdom.